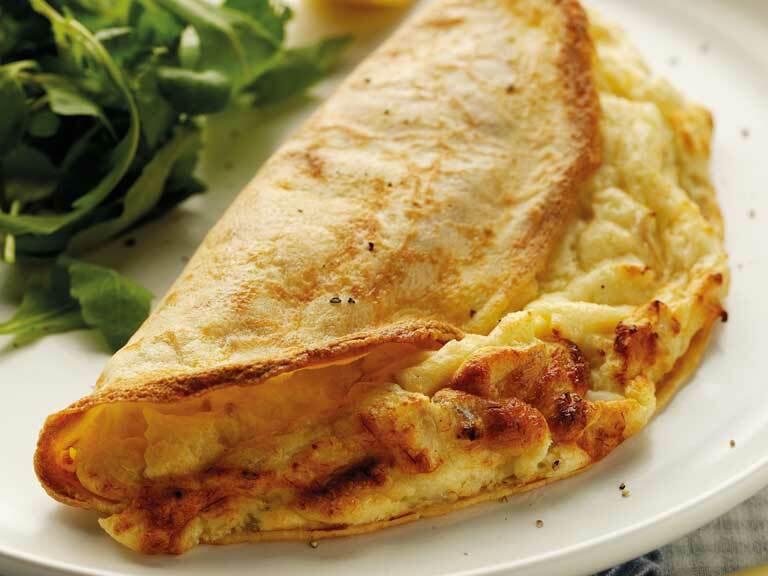 A savoury pancake filling of light soufflé with flaky smoked haddock. 1. Preheat the oven to 200°C/Fan 180°C/Gas Mark 6. To make the filling, place the smoked haddock fillet, skin side up in a frying pan, pour over the milk. Bring slowly to a boil, then cover the pan and gently simmer for 4 minutes. Lift the fish from the milk, remove and discard the skin and any bones, gently flake the fish. 3. Stir the egg yolks into the thick sauce along with the mustard if using. In a clean bowl, whisk the egg whites until they form stiff peaks. 4. Use a large metal spoon to stir the haddock and a third of the egg whites into the sauce mix. Then add the remaining egg whites to the bowl and gently fold into the sauce. 5. Place the flour, salt and eggs in a large bowl. Add half of the milk and whisk well until the mixture is lump free. Add the remaining milk and whisk again until smooth. If you prefer, place all ingredients in a food processor and blend until smooth. Pour the batter into a jug. 6. Heat a 20cm/8in diameter non-stick frying pan until hot, drizzle a little oil over the centre and wipe around the pan with a piece of kitchen paper. Pour a little of the batter into the pan and immediately tilt the pan to spread the batter thinly and evenly over the base. Cook for 1-2 minutes or until the top is set and the base is golden. 7. Flip over the pancake and cook for a further 1-2 minutes or until the base is golden. Transfer to a plate, cover with foil and keep warm. Use the batter to make a further 3 pancakes in the same way. 8. Lay 4 pancakes on an oiled baking tray. Divide the souffléd smoked haddock between them, spooning it over one half of each pancake. Fold over the pancakes. 9. Bake for 10-15 minutes until the filling is risen and golden brown. Use a fish slice to quickly transfer the soufflé pancakes onto serving plates and serve with a little salad and wedge of lemon.